Yesterday Dave Cameron posted his early picks for the AL All-Star Roster, which got me thinking about how I’d vote for the All-Stars if I bothered to do so. I’ve always been of the opinion that All-Stars should be selected based on who has performed the best since the last All-Star game. It’s usually just perennial All-Stars and guys who got off to a fast start in the first couple months of the season. But the guys who killed the back half of 2013 will get no love. So I took all the results from the past calendar year and ran them through the Zach Sanders z-score method for calculating fantasy value to see who has been the best in the last 365 days. Let me point out a few things to preclude any trolls from doing so in the comments. Yes, I know that the past calendar year includes games that were pre-All-Star break in 2013. But because we don’t have a “post-All-Star break to present” split on the leaderboards, I’m using 365. Also, I’m unsure of the exact roster construction rules, if there even are any. I’m picking twenty hitters per league with at least two players at each infield position but no more than three at any infield position. Finally, I’m aware that fantasy value doesn’t necessarily mean All-Star. But this is Rotographs after all, and after I post the would-be rosters, I’m going to do a quick bit of fantasy discussion based on the results so that this post somewhat belongs under the RG banner. 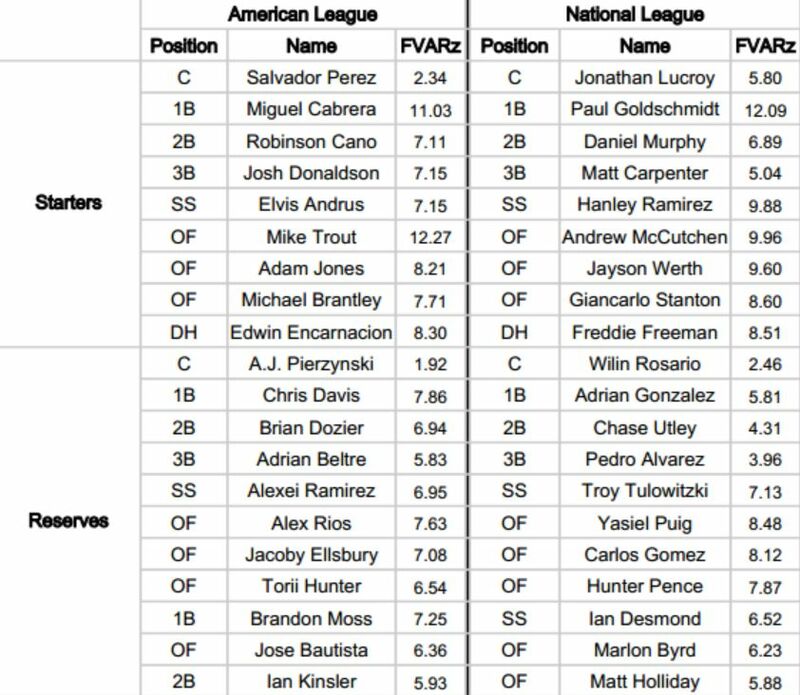 So without further ado, here is what the All-Star rosters would look like (hitters only) if you simply chose the teams based on fantasy value above replacement level over the last calendar year. Before we move on, I want to point out that Jayson freaking Werth rates as the third best fantasy outfielder in all of baseball over the last 365 days. I asked people on Twitter to guess who the #3 outfielder was, and it probably took 20 guesses before someone got it. In the past calendar year Werth is hitting .320 with 25 HR, 12 SB, and he has exactly 100 R and 100 RBI. Crazy. Finding something fantasy relevant to say about that group of players is tough considering they are almost all universally owned. There could potentially be some sell high recommendations to be made, but I want to touch on the guys in the group who are available in some leagues. All but four are 100% owned on ESPN.com, and one of the four is owned in 96% of leagues. But there are three guys who might be available in shallower mixed leagues: Marlon Byrd (77.2%), Wilin Rosario (67.2%) and A.J. Pierzynski (36.3%). It looked like Byrd’s career was over after he posted a 78 wRC+ in 2011-12, but he bounced back in a big way with a 136 wRC+ last year. Admittedly he is on the list above more because of what he did in the second half last year (148 wRC+), but he’s still been pretty good so far this year (115 wRC+). That’s been good enough to make him a top 40 outfielder on ESPN’s player rater so far, and a couple of guys ahead of him are on the DL. He’s old but he’s worth owning. Again, he’s probably only available in a few shallow mixed leagues, but if you’re in one those leagues, grab him. As for Rosario, he’s doing some things better this year than he did last year. He’s swinging a little less at pitches outside the zone and a little more at pitches inside the zone. He’s making more contact. All that has led to him walking more and striking out less. He’s still not walking all that much, but that’s not a huge concern since all we really want from him is power. And he’s providing power. His ISO (.189) is basically what it was last year, if not as high as it was in his debut in 2012. The problem is that his average has dropped so significantly that it’s tough to swallow despite the power. However, his line drive rate is about 5% below his career average, and it should surely improve. When it does his BABIP and batting average will follow suit. Pick him up if he has been dropped, and don’t give up on him if you’re starting to get frustrated. Pierzynski had a Byrd-like renaissance in 2012 with 27 home runs, and he followed it up with a more than respectable 17 homer, 70 RBI, .272 campaign last year in Texas. Unfortunately, his ISO is back down to where it was in 2011 when he hit just eight home runs. He could still have some use as a fill in if you need one given that he’s a left-handed bat and will have the platoon advantage frequently. But that’s the extent of his usefulness. We hoped you liked reading The Best Fantasy Hitters of the Past Calendar Year by Brett Talley! This is great! Can I get a steer toward more detail about FVARz? I’m not familiar with Zach’s z-score method, unfortunately! I make the same mistake frequently. It’s going to be a long time before I fully register the Astros as an AL team.